As humans, it is in our nature to essentially want what we want, when we want it. We are all guilty of this to some degree. It is easy to get frustrated when things don’t go the way we want them to or work out like we think they should. It is also easy to question God’s timing in different areas of each of our lives, even though we know that His timing is the best timing. For everything. Since being the intern at the Wolf River Refuge this year, I have had the opportunity to watch God’s perfect timing play out in many situations, but none of those situations have been as profound as the way in which everything literally fell into place with the taking down of the old Lodge building. The original building was first constructed in the year 1919, possibly by Louis and Estella Bucknam, though it’s hard to know for sure. It was dubbed “Bucknams’ Wolf River Lodge” and catered to trout fishermen, who flocked to the Wolf River, as back then it was a stream famous for its trout. It was both a place for the fisherman to stay and in those days it was a renowned restaurant in the area. The building torn down recently was not the original, as that lodge burned to the ground, all except for the dining room fireplace, in 1929. It was rebuilt in the summer of 1930. Ownership of the Wolf River Lodge was passed along a few times, first to the Taylors--Howard, the brother of Estella Bucknam, and Lily. They kept with the tradition of providing a welcoming off-road inn and restaurant, serving mostly fisherman. The Wolf River Lodge took a different direction when George and Helen Steed took over in 1971. The Wolf River, in the 1960s and ‘70s, became the place to go if you were into do-it-yourself adventure sports, such as white-water rafting, canoeing, and kayaking. The Steeds were avid participants in canoeing and wild-water racing, and so it makes sense that the Lodge became a sort of headquarters for white-water races. In the winter, the Lodge also became a place for those interested in cross-country skiing to get their fill of the newly popular sport. During the time of the Steeds, a two-story addition containing a modern kitchen with living quarters above was built. That addition, formerly attached to the old building, is what remains today next to the site where the Wolf River Lodge once stood until just recently. 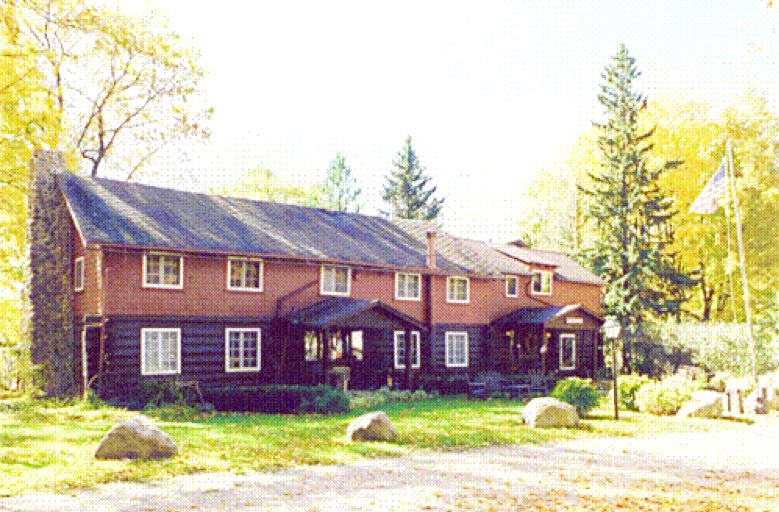 The Lodge was sold by George Steed to a woman named Joan Jesse and her then-husband, in the year 1988. Joan changed the direction of the Wolf River Lodge, yet again, in order to obtain a more peaceful environment. She did away with the focus on adventurous sports and camping, and instead, turned the place into more of a destination for families, couples, and those looking for a restful stay and a good meal, rather than adrenaline-filled and heart-pumping rides down the river. Several buildings were renovated, and others were built until the land had a little bit of something for everyone. In 2012, the land was purchased by Silver Birch Ranch in order to become a quiet place for developing healthy relationships with God and one another. It was called the Wolf River Refuge, and the ministry here is inspired in part by Psalm 91. Verses 1-2 of that Psalm say this: “He who dwells in the shelter of the Most High will abide in the shadow of the Almighty. I will say to the Lord, ‘My refuge and my fortress, my God in whom I trust.’” (ESV) Our goal is for the Wolf River Refuge to be a place where you can come and enjoy time with God, your family, your friends, or whomever you decide to bring. The main building sits on a hill overlooking the beautiful Wolf River, and throughout the property, God’s unique and intelligently formed creation is on display. The year is now 2018, which is just around 100 years since the original Lodge building was established on the property of what is now the Wolf River Refuge. I came into my internship in August 2017, knowing that at some point, the once beautiful, pristine, Lodge portion of our main building was going to be taken down. The Lodge had sadly just become unstable throughout the years, and was unkempt, crumbling, and unused. Guests were not allowed in there because it was simply just veering on the unsafe sides of things, though it was not too unsafe to work in there to clear things out and get it ready to come down. The far wall by the fireplace of what was the dining room had actually started to collapse and there was a metal ceiling jack keeping that portion of the ceiling in a somewhat upright position. God’s ways are perfect, and He works things out in such an interesting manner. For example, I have always been fascinated with that which is old, and historic, and so being the intern at the WRR this year has seemed like the perfect fit. For me to be around during a project that has to do with an old building that has so much history surrounding it-perfect. God’s timing is also perfect. Like I said, I knew that the Lodge was going to come down, but none of us knew exactly when that was going to happen. There was not much talk about it earlier in the year, as there were so many other things we were focused on, and it seemed to be just a far-off idea. Then about halfway through the year, it looked like we had someone interested in not only taking down the building but also buying the windows and some wood to be repurposed elsewhere. Suddenly, we no longer had this prospective person interested in taking down the building, and we were back to square one as something approached which would cut the cord of the whole ordeal--spring. I say spring, but what I really mean is the time-period, usually anywhere from early March until May, when the paved roads are at their weakest, due to freezing and thawing caused by melting snow and the fluctuating temperatures. That period is when the Class II roadway restrictions are posted which essentially means you have to be very careful about how much weight you are hauling. The problem we were facing is that we were going to be taking down a building, and with that came hauling all the debris to some place where we could dispose of it. Around the beginning of March, I had asked Steve, the Director of the Wolf River Refuge, if we were going to take down the Lodge building. His answer was that we were not going to, because the road restrictions could be put on any day, and it was too big of a project to try to rush and decide to do right then. Not long after this conversation, I walked into our office after lunch, and Steve told me that we were going to be taking down the Lodge in a few days. God definitely had control of this entire process and the timing of everything, because there is no way that things would have worked out so perfectly if He had not. We had people who were willing to take the building down, but after careful consideration, Steve told them that the road restrictions were going up, and that it was not going to work--that the timing was just not right. They called Steve up and basically told him that they could have the building down and the debris cleared the day right before the restrictions went up. The Lodge was down, and March turned out to be one of the driest months that it has been in a while, which was all in God’s timing. The relatively dry conditions were ideal for the construction that had to be done on the building that remained, as what had once been attached was now open and needed to be closed up. Not only that, but God also provided two people to repurpose parts of the Lodge, such as windows and some wood. The money from that helped to pay for the clean-up costs. The work was done on it, the building was finished, or at least closed up, and the very next day it started to snow. What this process has shown me is that God likes to hold us at the end of our skis, an analogy used by Garrett Higbee, and see if we will shy away from what we can see right before us. What we needed to do, in this and every situation, is rely on Him for His guidance and remember the truth that He will give us tasks that seem impossible, and which are only possible with Him. Realistically, the timing for all of this should not have come close to working out, and yes, it was rushed, and it all seemed to happen at once, and it was a blur. Yet, by God’s grace, we just had a big snowfall, and it did not affect our newly closed-up building, because the work that needed to be done on the outside to protect it had been completed literally the day before. God’s timing is perfect, and His ways are good. Wait for the Lord, because He will never leave you nor forsake you. He knows when the things you are praying about will or will not happen, and He will work things out for and in His will.